Lyft, the transportation on demand company that is heading to a $15 billion IPO in 2019, is racing ahead with its autonomous vehicle plans. TechCrunch has learned that it is acquiring the London-based augmented reality startup Blue Vision Labs and unveiling its first test vehicle to advance its vision for self-driving cars. The first car from Lyft’s Level 5 self-driving initiative will be the Ford Fusion Hybrid. Lyft’s use of a Ford Fusion apparently isn’t associated with the partnership the two announced last year. 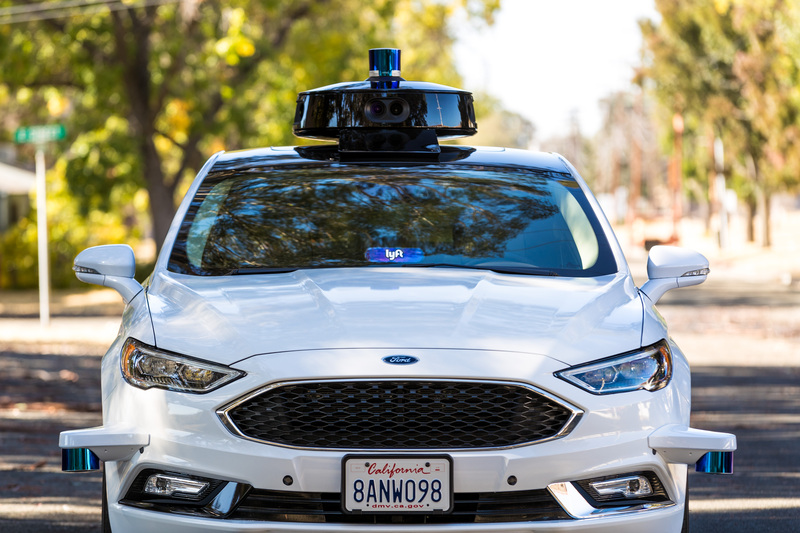 Other AV companies have used the Ford Fusion as a platform for integrating self-driving technologies. While the integration of Lyft’s autonomous technologies and a Ford car is impressive, perhaps more meaningful is the company’s acquisition of Blue Vision Labs, a startup out of London that has developed a way of ingesting street-level imagery and is using it to build collaborative, interactive augmented reality layers — all by way of basic smartphone cameras. Blue Vision will sit within Lyft’s Level 5 autonomous car division headed up by Luc Vincent (who joined the company last year as VP of engineering after creating and running Google Street View). The startup and its staff of 39 (everyone is joining Lyft) will also become the anchor for a new R&D operation in London or the San Francisco-based company, focused on that autonomous driving effort. Level 5 is stepping up a gear in another way today, too: Lyft is unveiling a new vehicle that it will be using for testing. Blue Vision has developed technology that provides both street level mapping and interactive augmented reality that lets two people see the same virtual objects. The company has already built highly detailed maps that developers can now use to develop collaborative AR experiences — it’s like the maps of these spaces become canvasses for virtual objects to be painted on. Over time, we may see various uses of it throughout the Lyft platform, but for now the main focus is Level 5. People familiar with the acquisition tell us Blue Vision is being acquired for around $72 million with $30 million on top of that based on hitting certain milestones. Lyft has declined to comment on the valuation. Blue Vision had raised $17 million and had only come out of stealth last March, after working quietly on the product for two years. Investors included GV, Accel, Horizons Ventures, SV Angel and more. This deal is notable in part because this is the first acquisition that Lyft has made to expand its autonomous car operation, which now has 300 people working on it. At a time when many larger companies are snapping up startups that have developed interesting applications or technologies around areas like AR, mapping, and autonomous driving, there may be more to come. “We are always evaluating build versus buy,” Vincent said when asked about more acquisitions. But he also acknowledged that it is a very crowded field today, even when considering just the most promising companies. “I don’t have a crystal ball but arguably there are quite a few players today, including big tech, startups, OEMs and car makers. There are well over 100 [strong] companies in the space and there is bound to be some consolidation.” Lyft earlier this year also inked an investment and partnership with Magna to integrate its self-driving car system into components it supplies to car makers. But it also might face other pressures. The company counts Didi and GM among its investors, and both of these companies are making their own big strides in self-driving technology and each has inked deals to have more partners using that tech, in part to justify some of their own hefty investment. Lyft, of course, will hope that acquisitions like Blue Vision will give it more leverage, and make it one of the consolidators, rather than the consolidated. Blue Vision’s use of smartphones to ingest data to create its street-level imagery and mapping is crucial to Lyft’s quest for scale. In effect, every Lyft vehicle in operation today, with a smartphone on the dashboard, could be commandeered to become a “camera” watching, surveying and mapping the roads that those cars drive on, and how humans behave on them, using that to help Lyft’s autonomous vehicle (AV) platform learn more about driving overall. In the race for data to “teach” these AI systems, having that wide network of cameras deployed and picking up data so quickly is “game changing,” said Peter Ondruska, the co-founder and CEO of Blue Vision. Lyft up to now has really concentrated its business presence in North America, and so this marks at least one kind of way that it is expanding on the other side of the pond. It opened its first European office in Munich earlier this year, a sign that it’s looking to this part of the world at least for R&D, if not to expand its business footprint to consumers, just yet. Vincent declined to comment on whether Lyft would get involved in autonomous trials in London, nor whether it would expand its transportation service there. Another key area that is worth noting is that Blue Vision’s “collaborative” VR, which lets people look at the same spot in space and both see and create interactive, virtual figures in it, could be used by Lyft either to help drivers and would-be passengers better communicate, or even help passengers discover more services during a journey or at their destination. When Ondruska first spoke to TechCrunch earlier this year as the company emerged from stealth, ride hailing applications, in fact, were one of the use cases that we pointed out could be helped by its tech. Blue Vision isn’t the only company working to develop these virtual maps for the world. Startups like 6d.ai, Blippar and the incredibly well capitalized and wildly successful AR technology developer Niantic Labs are also building out these virtual maps on which developers can create applications. Indeed, Niantic’s Pokemon Go game is the most successful augmented reality application to date. Large media companies have also been investing building content for these platforms, and investors have poured hundreds of millions of dollars into startups like 6d, Niantic, Blue Vision, and others that are building both software and hardware to usher in this new age of how we will, apparently, all soon be seeing the world. The development of these new platforms will go a long way toward ensuring that more useful applications are just around the corner, waiting for users to pick them up. The deal marks Lyft’s tenth acquisition, according to CrunchBase. In 2015, Lyft acquired the disappearing messaging company, Leo, to bring the company’s messaging expertise in house. Two years later, the ride-hailing company went on an acquisition tear, hoovering up FinitePaths, YesGraph, DataScore, and Kamcord. The first three seem like strategic acquisitions to bulk up mapping and marketing efforts internally; but Kamcord, a social media network for video sharing, seemed a little farther afield. For more on Lyft’s bigger plans for AV, watch the video below of Vincent talking about the company’s roadmap (so to speak).